RSPCA Shop is a charity shop selling a variety second-hand items such as clothes, kitchenware and furniture to raise money for animal welfare charity the Royal Society for the Prevention of Cruelty to Animals. 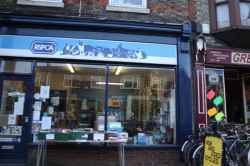 Based in Mill Road, Cambridge, RSPCA Shop is a charity shop. RSPCA Shop is in Mill Road Cambridge. You can view a list of neighbouring businesses by going to the Mill Road page. Note: the pin is positioned at the postcode centre, and may not correspond with the precise location of 188 Mill Road.